Before Charles Xavier and Erik Lensherr took the names Professor X and Magneto, they were two young men discovering their powers for the first time. Before they were archenemies, they were closest of friends, working together, with other Mutants, to stop the greates threat the world has ever known. In the process, a rift between them opened, which began the eternal war between Magneto's Brotherhood and Professor X's X-Men. That text is on all the X-Men First Class Minimates, rather than individual bios, so we're just reproducing it here instead of putting it in every review every time. In the early planning stages, the movie that became X-Men First Class was originally going to be (in the same vein as X-Men Origins: Wolverine) X-Men Origins: Magneto. That's why the movie started out with him, and he remained the main focus all the way through. Personally, I'd have loved to watch two hours of "The Sinister Adventures of Erik Lensherr, Nazi Smasher," but what we got was pretty awesome as well. The movie costumes, which were blue and yellow in honor of the comics, were patterned after 1960s space suits. The upper body is painted front and back with all the appropriate details, but the legs only get paint on the front - but since it's just thin black lines over the Williamsburg Blue uniform, you're unlikely to notice any absence. The likeness of Michael Fassbender (in his third comicbook movie!) is quite good: it's unmistakably him. Find him some blonde hair and you've got yourself a Minimate David 8! He comes with a grey and silver version his iconic helmet - this one is a repaint of the Age of Apocalypse helmet, but the design is close enough to the film for all intents and purposes. 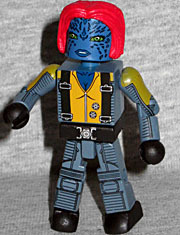 The biggest character change, in terms of both the film series and the comics, was Mystique. It was pretty shocking when the first cast photos came out and revealed she was going to be part of the team, rather than a villain. In the comics, she's been active since the late 19th century, but the movie moved that way up, to the middle of the 20th. Unlike the previous films, Mystique wasn't walking around naked. We know she was already capable of faking clothes, so maybe that was just a choice made for convenience's sake. Raven was played by Oscar-winner Jennifer Lawrence, perhaps best known for playing "Girl" in The Hunger Games. Between the lack of a nose and all the scales painted on her face, there's no real likeness to speak of here; this could just as easily be Rebecca Romijn-Lettuce. The face is a lovely dark blue, offset by the vibrant red hair - a new mold, I believe? 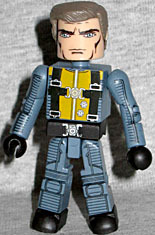 Hasbro opted not to make any toys for X-Men First Class, which is kind of a bummer: the movie was great, and even if all we got were 4"ers, it would have been nice to have a collection of those snazzy uniforms. Good thing Art Asylum was there to pick up the slack!